Here are all the crazy things that happened during Game 1 of the World Series. 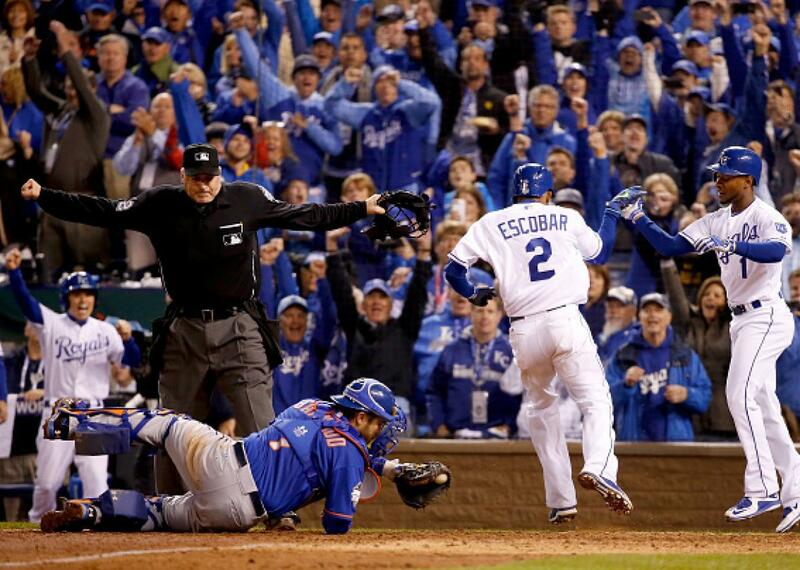 Alcides Escobar at home plate—the ending was actually one of the less crazy things that happened. Too many things happened during Game 1 of the World Series between the New York Mets and the Kansas City Royals on Tuesday. (Technically, too many things happened on Tuesday and Wednesday, as the game went to 14 innings and into a second day.) The evening started with tragedy when news broke that Royals pitcher Edinson Volquez’s father had died from a longtime heart condition right before Volquez was due to start in the opening game. After the game got underway with Volquez still ready to take the mound—there were contradictory reports as to whether or not he was informed of his father’s death before the game—things got very strange from the very first pitch. In the fourth inning, the national feed of the Fox broadcast went out across the country because “a rare electronics failure caused both the primary and backup generators inside the Fox Sports production compound to lose power.” The national telecast of the World Series then missed an at-bat. In the sixth inning, the Royals came back from 3-1 down to tie the game. In the eight inning, Wilmer Flores—who cried in the middle of a game earlier in the year after he was mistakenly told he had been traded—hit a bouncer to first base that Royals first baseman Eric Hosmer tried (and failed) to backhand, allowing in the go-ahead run to score. Flores became the first batter to put a team ahead by reaching on an error in the 8th inning of a game or later since 1986 … when a Mookie Wilson grounder to first baseman Bill Buckner dribbled through his legs and helped win the game for the … New York Mets. With one out in the bottom of the ninth and trailing 4-3, Alex Gordon hit a solo home run off of Mets closer Jeurys Familia, who had converted 21 straight saves entering the day. It was the first time the Mets had been in a World Series Game 1 since 2000 when … they gave up a one-run lead in the bottom of the ninth against the New York Yankees. This game would go onto surpass that one as the longest Game 1 in Series history. In the tenth and eleventh innings, Jon Niese pitched two scoreless inning on his 29th birthday. It was also 29 years ago to the day that the New York Mets clinched their last World Series title. And 30 years ago to the day that the Royals clinched their last one. In the fourteenth inning—after having gotten out of a bases loaded jam in the twelfth—42-year-old Bartolo Colon loaded the bases again with nobody out. This time, Hosmer closed out the victory with a deep fly to right field as Escobar—the man who opened the game with that inside-the-park home run—tagged up and raced home to score the game winner. Game 2 gets underway at 8:07 p.m. on Wednesday. How could you not be looking forward to it? Correction, Wednesday, Oct. 28, 9:30 p.m.: This post originally said the inside-the-park home run happened on the first pitch of the game. It happened on the first pitch the Royals faced.